By Breeders' Cup Classic Grade I winner Wild Again leading sire of 5 Champions and 81 SW's with a total of 154 stakes horses. Out of stakes winner Voodoo Lily. Voodoo Lily is by the excellent sire Baldski (Nijinsky) broodmare sire of 31 SW's. Activist's first foals arrived in 2001. 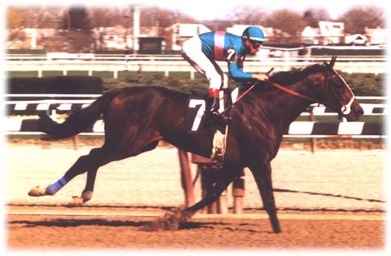 Un-raced at 2, Activist was highly respected by trainer Bobby Frankel. Activist broke his maiden in his second start at Aqueduct by 8 1/2 lengths going the mile in 1:34. His speed rating was 106. Just two weeks after, he ran in the G2 Wood Memorial finishing fifth to Captain Bodgit. In this year he made one more start in the Grade 2 Swaps Stakes at Hollywood Park. Unfortunately an injury in the stakes brought his promising career to an end. During his career he earned $51,760 from five starts. Lily O' Gold who earned $280,875 and grade 1 stakes placed Magical Illusion winner of $111,220. Voodoo Lily was a three times stakes winner of $250,370. Her full brother, Stone Bluff, was a stakes winner of $202,490; her half brother, Gizmo's Fortune, was a stakes winner of $148,708.